Research has provided a shocking new assessment of the speed with which major climate changes can sweep across our planet. ​​The most precise evidence of rapid climate change comes from cores extracted from mountain glaciers and from the larger ice sheets of Greenland and Antarctica. Annual layers in the glacial ice provide the chronology and key data on snowfall, temperature, influx of dust, and trace gases from the ancient atmosphere trapped in air bubbles. ​​There is ominous evidence that, during the past few thousand years, Earth's climate has been anomalously tranquil compared to its behavior during the preceding hundred thousand years. 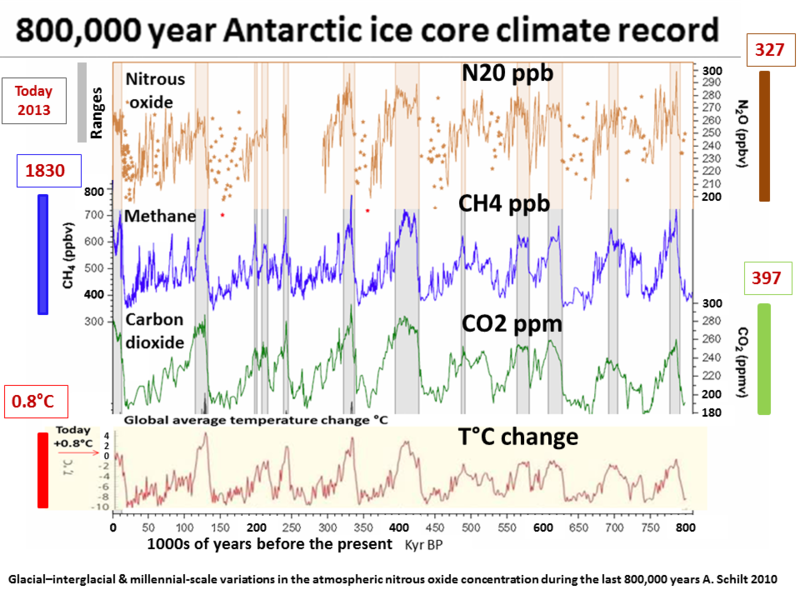 Ice-core records show that climate changes in the past have been large, rapid, and synchronous over broad areas extending into low latitudes, with less variability over historical times. These ice-core records come from high mountain glaciers and the polar regions, including small ice caps and the large ice sheets of Greenland and Antarctica. The IPCC 2007 AR4 ​ Arctic Ch 15 warned of feedback abrupt change. ​catastrophic consequences, cannot be ruled out. In 2002 the national research council of published a comprehensive ​report on abrupt climate change inevitable surprises. A 2004 short report followed. The NRC published another ​comprehensive report in 2013 Abrupt Impacts of Climate Change ​Anticipating Surprises. ​​Abrupt climate change may occur by a triggered tipping point. The faster the rate of today's warming is the less it is possible to adapt to or to control. Today's warming is sudden is this context. ​​​​​The oceans are the ultimate determinant of climate. Ocean heating is clearly abrupt (2017 research finds it the highest in the past 100 million years. Ocean acidifcation is abrupt. Arctic warming is clearly abrupt and so is northern hemisphere warming, but these are not recognized as such. There is clearly an abrupt cooling of the North Atlantic, due to Greenland melt water. Today's ocean heating is abrupt (sudden) and accelerating. Abrupt Arctic change The Arctic is now heating up over 2x the global average, which is abrupt and causing adverse abrupt Arctic changes, making Arctic climate change abrupt by any definition for policy. ​​​The real question is do today's record high atmospheric GHGs have the world committed (locked in) to actual abrupt catastrophic impacts to the planet. There is evidence from amplifying feedback science that this is the case. 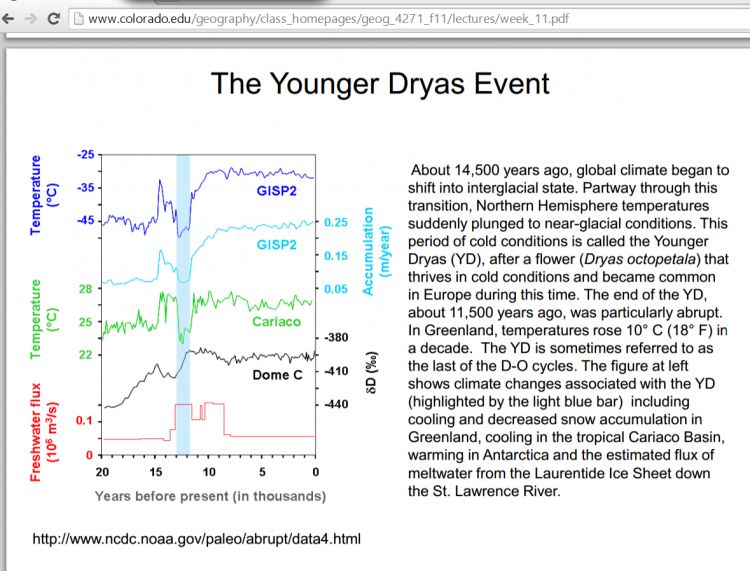 The most recent and dramatic example is the Younger Dryas ​​13,000 years ago, of abrupt cooling terminated by an abrupt warming of 10C in a only a few decades. The sudden warming is attributed to methane and CO2 from wetlands and thawing permafrost. chances of crossing tipping points all the more likely. ​​The question is now whether the surprises can be anticipated, and the element of surprise reduced. That issue is addressed in this report. The abrupt climate changes and abrupt climate impacts discussed here present substantial risks to society and nature. The ability to anticipate what would otherwise be “surprises” in the climate system requires careful monitoring of climate conditions, improved models for projecting changes, and the interpretation and synthesis of scientific data using novel analysis techniques. In light of the importance of actionable information about the occurrence and impacts of abrupt changes, it is the Committee’s judgment that action is urgently needed to improve society’s ability to anticipate abrupt climate changes and impacts. To address these needs the Committee recommends development of an Abrupt Change Early Warning System (ACEWS). Surprises in the climate system are inevitable: an early warning system could allow for the prediction and possible mitigation of such changes before their societal impacts are severe. Identifying key vulnerabilities can help guide efforts to increase resiliency and avoid large damages from abrupt change in the climate system, or in abrupt impacts of gradual changes in the climate system, and facilitate more informed decisions on the proper balance between mitigation and adaptation. With adequate scientific monitoring and study of these potential changes to the climate system, the probability that society can anticipate future abrupt climate changes and impacts will be substantially increased. ​The US under the Department of Energy has a special research project called the Investigation of the Magnitudes and Probabilities of Abrupt Climate TransitionS (IMPACTS) Project. It addresses four abrupt situations. Mega droughts in North America, including the role of biosphere-atmosphere feedbacks. 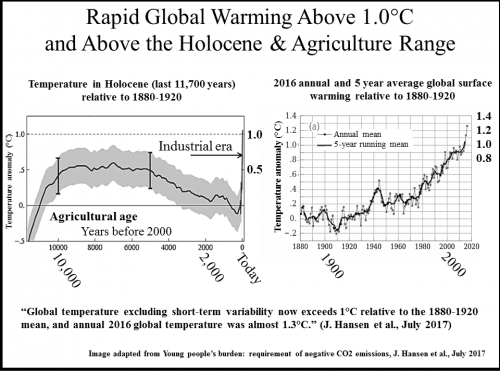 It is quite a contradiction to expect unpredicted abrupt change to be somehow predictable, and even if we could predict an abrupt even by the very nature of abrupt climate change, there is nothing we could do about it. The 2013 assessment has concluded that the threat from abrupt climate events this century is less than had previously been feared, but ​​this relies on computer models and climate models inherently do not capture sudden non linear change. consequential changes. Thus, they merit further study. Summary chart of abrupt climate situations and assessment 2013. ​​24 April 2018 Collapse of the Atlantic Ocean heat transport might lead to hot European summers (& colder winters). 26 Oct 2017 ​​Current climate change unparalleled over the last 100 million years? Dec 2014​ Two massive, rapid releases of carbon during the onset of the Palaeocene–Eocene thermal maximum - most likely CH4 hydrate. ​​​Reducing abrupt climate change risk .. 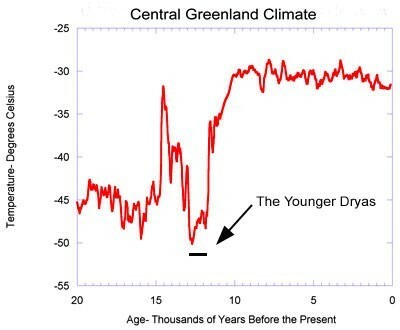 The most recent and dramatic example of sudden abrupt (as sudden)climate change is at the end of the abrupt 'Younger Dryas' cooling ​​13,000 years ago. 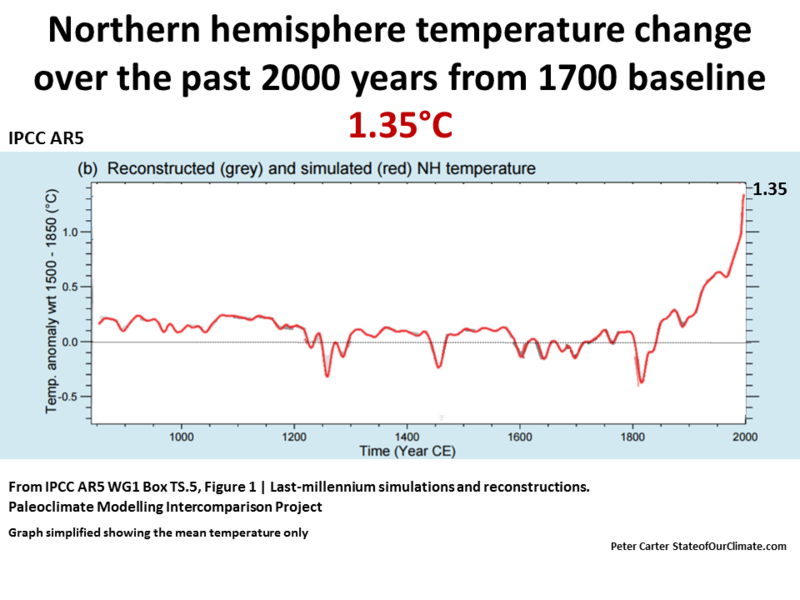 Greenland ice cores showed this was a Northern hemisphere sudden huge warming of 10C in o​nly a few decades. The sudden warming is attributed to methane and CO2 from wetlands and thawing permafrost, but nitrous oxide is also linked (IPCC AR4) .That makes today a global emergency situation. ​​Today's sudden decline in Arctic summer sea ice cooling is expected to cause abrupt climate changes outside of the Arctic (Holocene warming marked by abrupt onset of longer summers ..., P. A. Mayewski, 2014). ​ The sudden temperature spike now is up to 1.1C (2016) is abrupt, and is above the global temperature limit of the Holocene. End Younger Dryas Abrupt Warming: 10C in a few decades! ​​The atmospheric increases of all three main greenhouses are clearly abrupt. In particular atmospheric CO2 is accelerating faster than ever (2017) at a rate without past precedent (WMO 2017). 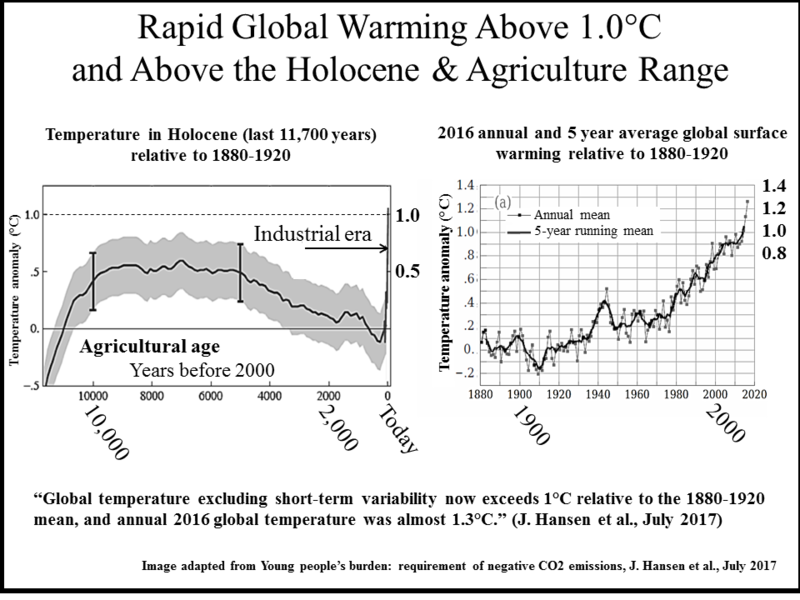 ​There is no question that today's abrupt atmospheric greenhouse gas levels have led to a dramatic obvious sustained abrupt accelerating radiative forcing (heating) of the biosphere (see: dramatic graphs from the2007 IPCC asessment). This is a most policy relevant definition of abrupt climate system change.